If social media seems like a big waste of time to you, you’ll want to sit up and take notice of some of the statistics that state otherwise. Small businesses that fail to add social media to their marketing repertoire miss out on potential revenue and leads. Even if you only invest a little time each week, a social media page allows you to reach new customers and keep track of current ones. About 66 percent of businesses state finding new leads is one of their biggest challenges. Combine the concern of finding new customers with the fact that 70 to 80 percent of consumers do research online before buying from a company, and it becomes clear you need a strong online presence if you want to reach new customers consistently. Customers expect you to be on social media. Creating a social media presence is affordable enough for even the smallest businesses and benefits your company in many ways. Your customers have hundreds of businesses competing for their attention. When you create a social media presence, it allows you to keep your business at the forefront of their minds. Tweet out a reminder about the big sale today or send a Facebook message to your top customers and let them know you have a special discount exclusively for them. They, in turn, will like and share your posts, expanding your reach to their friends and family. 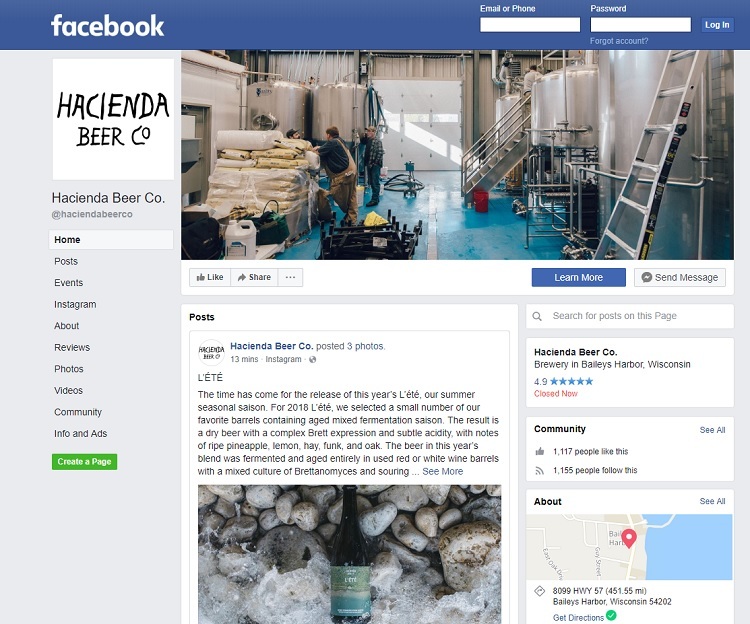 Hacienda Beer Co. uses their Facebook page to keep their customers and potential customers updated on what is new. For example, they share when they have a seasonal release, post photos and describe the beer. They also educate their customers by sharing info on the process they use to create their craft beers, such as what type of hops they use. Their following isn’t huge, but it doesn’t have to be. They only need to reach people who love their beer. Most social media channels allow businesses to create ads and target them to a specific audience. Narrow down your audience by location, gender, age and even interests. Reach only your ideal customers, making your advertising budget stretch further and your return on investment increase. In the past, you had just a couple of communication methods. You could email your customers, talk to them in store or reach out via email. Today, however, social media has taken the place of much communication. When people want a fast update about your menu specials for the day, they’ll head to Facebook. Wing Tactical uses social media to stay in touch with their customers on Facebook and Instagram. Note the prominent links at the bottom of their landing page and the invitation to site visitors to “connect with us.” On their social media, they throw out mentions to customers, feature images of their products and highlight reviews. If you want to start with just one social media channel, look at Facebook. It is the largest social media network, with more than 2.23 billion active users. Also, you can seek leads through targeted advertising and reach just those people in your target audience. Facebook is almost a given in social media marketing, although Instagram is closing in. Every business needs to start somewhere with their online presence, so give Facebook a try, then expand from there. More and more people access the Internet via their mobile devices. Most Americans own a cell phone, and about 77 percent own a smartphone. As people go about their day, they browse the Internet via their smartphones. Fifty-two percent of people are less likely to engage with a brand if their mobile experience is negative. Social media is a natural attraction for mobile users, especially image-heavy sites such as Instagram and Snapchat. If you want to attract these mobile browsers, create a presence on one of these two sites. 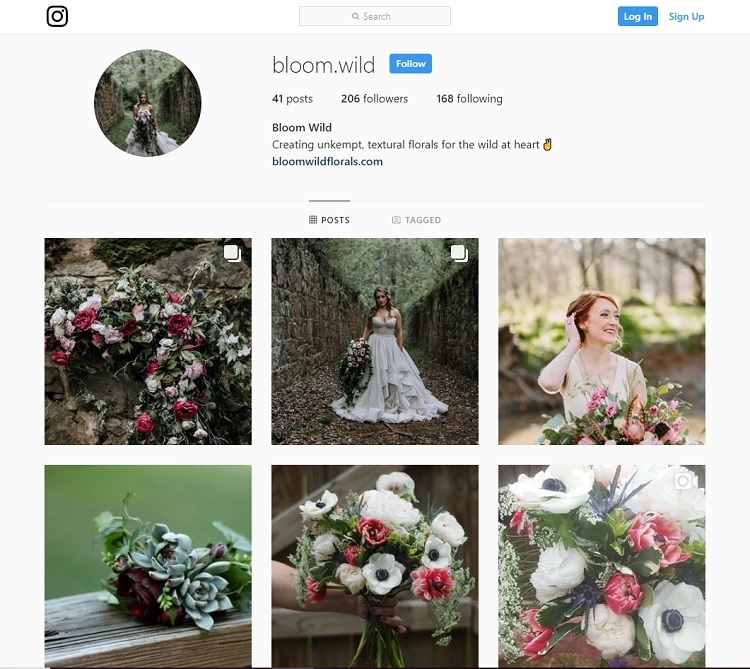 Bloom & Wild uses Instagram to reach out to current and new customers with gorgeous photos of their flower arrangements. Their photos attract brides and anyone wanting a natural, beautiful bouquet of flowers found in nature. Instagram is the perfect medium for this type of online marketing. You can also use social media to reach out to those customers already following you on whichever platform you choose. You can offer special discounts for those already on your list and bring in additional revenue from people who already love your product. Also offer friends and family discounts, which allows your fans to spread the message about a product or service they already love. It costs five times as much to gain a new customer as it does to keep a customer you already have. Good customer service is one of the key factors influencing whether a consumer stays with a company or moves on to a competitor. Social media allows you to notice those gripes and negative posts before they get out of hand, reach out to those customers and ensure you’re doing everything possible to keep them happy. Tails offers customized dog food based on each dog’s specific needs. Their food even comes with a portion scoop designed specifically for the portions your dog should eat, keeping them at a healthy weight. 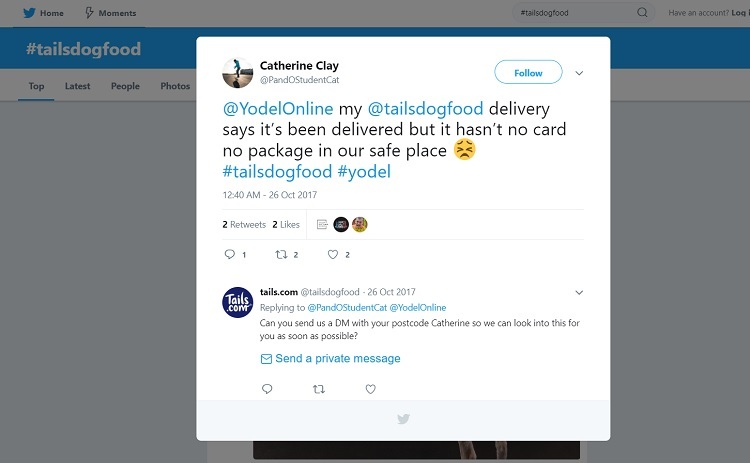 People naturally wonder about trying a new food for their dogs and have a lot of questions, so Tails has a strong presence on both Facebook and Twitter, where they answer any questions their customers have. Note the interaction in the Twitter screenshot above. Even if most of your customers visit a physical store or you are a service-based business, an online presence is still important for that initial contact and driving new traffic to your store. A social media presence leads to additional leads and potential sales, but your online presence is about far more than money. Connecting with your customers is one of the most powerful things you can do as a business. Keep them engaged, and they’ll become your street team, sharing your product with others and why they love your business. It’s a complete mistake not to use social media for marketing and advertising! More then 2 BILLION people use social media.It’s the biggest source of traffic accessible for anyone’s use! Even if you use free traffic methods in social media, you still can attract many leaders and team members to your opportunity.